Xiaomi made its debut at the CES this year and with it came the ceramic white Mi MIX to grace the occasion. If the Chinese OEM has no plans of changing this, the Xiaomi Mi MIX 2 should also be showcased at the CES 2018, which is less than a month away. The CES 2018 will kick off on January 9 and end on January 12, but like many other OEMs, Xiaomi has not confirmed attendance. Despite this, it’s still possible that the Xiaomi Mi MIX 2 could show up at the event, which, as usual, will be held in Las Vegas. 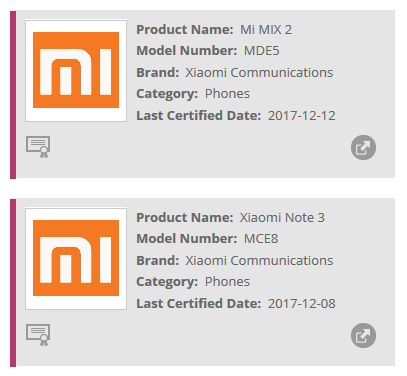 Alongside the Mi MIX 2 could be the Xiaomi Mi Note 3, which was also made official together with the bezel-less MIX 2 a while back. This claim follows a recent listing of the two devices on Wi-Fi Alliance, which means that Xiaomi is getting ready to release the pair to the global market. There couldn’t be a better event to showcase these two beauties to the world than the CES 2018, which makes sense that the WFA has certified the two. As noted, the Xiaomi Mi MIX that was released at the CES 2017 had one major difference from what had already been released a few weeks before. It came with an all-new ceramic white finish, but everything else remained unchanged. The Xiaomi Mi MIX 2 not only comes with a ceramic white variant, but it also gets a ceramic black variant. It’s possible that both or either of these two will be showcased at the CES 2018 event. It’s also possible that Xiaomi might just be getting ready to release the two phones in more markets and that this has nothing to do with the CES 2018. Either way, it should be a win-win for everyone. Apart from storage (128GB) and RAM (8GB), all other hardware specs and features of the ceramic variant of the Xiaomi Mi MIX 2 remain the same as the standard model (6GB RAM). This means you get a 5.99-inch LCD display with Gorilla Glass 4 and full HD+ resolution, Snapdragon 835 SoC, Android 7.1 Nougat, 12MP camera with 4-axis OIS, PDAF and dual-tone LED flash, 5MP selfie camera and a 3400mAh battery unit that supports fast charging via USB-C port. There’s no 3.5mm audio jack and the fingerprint scanner is rear-mounted. As for the Xiaomi Mi Note 3, you get a design that is very similar to the Xiaomi Mi 6, only that it’s bigger and less powerful. It packs a 5.5-inch 1080p display screen with Gorilla Glass 4, Snapdragon 660, 6GB RAM, 64GB/128GB storage, dual 12MP camera with 4-axis OIS, 2x optical zoom, PDAF and dual-tone LED flash and a 16MP selfie camera. There’s a bigger 3500mAh battery unit that supports fast charging via a USB-C port, which is also used for audio connectivity. The phone, like the Mi MIX 2, comes with Android 7.1 Nougat, but the fingerprint scanner is front-mounted.